The 5,000 members of the Seattle Education Association (SEA) organized their first strike in three decades to start the new school year. While school districts across the country are facing federal pressure to link teachers’ evaluations to their students’ test scores, the SEA was able to end this widely discredited practice in Seattle. Students of color are three times more likely to be suspended or expelled in the city’s schools, so the union won “racial equity teams” at one-third of them. The new contract guarantees 30 minutes of recess for all students, introduces caps on caseloads for some school social workers, lowers student-to-teacher ratios for special education classes, and pushes back on declining real wages after six years of not receiving a cost-of-living adjustment from the state. Had the union mobilized its full support from the public, it’s likely even more could have been won. Nonetheless, this contract is something SEA members can be proud of and build upon for the future. Drawing lessons from the 2012 Chicago Teachers Union strike, the SEA was able to mobilize parents and community members who have seen Washington State become an active battleground in the fight for public education. The active participation of members was outstanding. Between 95 and 97% were on the picket lines. Thousands came to the union’s meetings. The union included 40 people from all professions in the bargaining team. A daily leaflet provided educators with updates from the union. Demands combined workplace issues and wages with calls for better education and racial equity. The local legislature is being held in contempt by the State Supreme Court and fined $100,000 per day due to their failure to adequately fund public education. In May, the Washington Education Association organized 57 school districts to walk out in protest and 6,000 union members and parents marched in the streets of Seattle. After the Seattle Public Schools district stalled negotiations with the SEA all summer and then refused the union’s demands wholesale at the final hour, members voted unanimously to strike. 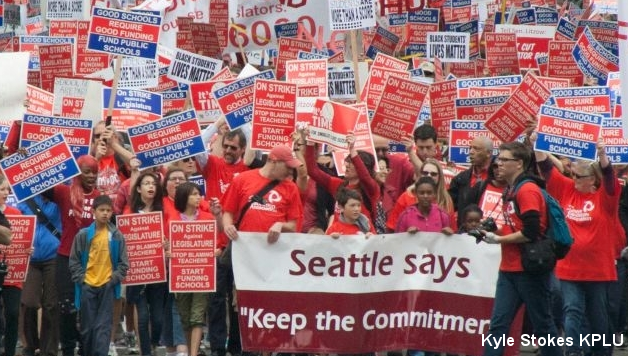 The strike inspired parents, students, and working people in Seattle and around the country. Unfortunately, the union did not call for a big mobilization of support, but parents organized a rally of more than 600 and gave a glimpse of the support the educators enjoyed. A mass rally organized by the union and vividly mobilizing the full public support for educators in Seattle could have strengthened the position of the bargaining team against the district and given a big boost to the confidence on picket lines. Socialist Alternative members within the SEA advocated for the idea of a mass march, and many rank-and-file members supported our proposal. It is now incumbent upon Seattle teachers and the labor movement as a whole to take the lessons learned by the SEA to help rebuild strong unions as the backbone for future struggles for quality public education and social justice. Previous articleHelp Hold Kshama Sawant’s Seat for the 99%!